Introduction – Seeyamangalam is Tamil form of siya (Sanskrit simha) of Simhamangalanam, perhaps named after Narasimhavarman I Mamalla, as suggested by K R Srinivasan. However R Nagaswamy suggests that its original name was Simhavishnu-caturvedi-mangalam and it was named after Mahendra’s father Simhavishnu. As there is a cave temple attributed to Mahendravarman, hence it would not be wrong if we say that this village was already in existence when this temple was executed. Hence it is more appropriate to accept the claim of R Nagaswamy. Seeyamangalam is a small village located near Desur. This village has a reputed Shiva temple named Stambhesvara or Tun-Andar (in Tamil, ‘the lord of pillars’). This name Tun-Andar might be given because of two pillars in front of this cave temple. Stambheshvara name was perhaps given due to a high boulder standing on the floor of dry tank near this temple. As per a legend, when the tank was full of water, only the tip of this free standing boulder was visible which is revered as Shiva lingam in the water, hence the name Stambheshvara. This temple has been extended during late Pallavas, Cholas and Vijayanagara times. Now we see two mandapas erected in front of this cave, totally hiding it from the front. From a Chola inscription of this temple, it is found that Seeyamangalam would be belonging to Tennarrur-nadu (region named after Tennattur), a subdivision of Palagunra-kottam, a district of Jayangonda-Chola-mandalam. The temple itself was then called Tirukkarrali, ‘the scared stone temple’. A foundation inscription of Mahendravarman I names this cave as Avanibhajana-Palleveshvaram. Cave Temple – As the temple has seen quite a few extensions so the cave is mostly obscured from outside. The west facing cave’s front façade is supported on two pillars and two pilasters. The pillars are of usual Mahendra style, differentiated in saduram (cubical top and bottom part) and kattu (intermediate octagonal part) while the pilasters are also differentiated in same manner. This style of pilasters we have seen at Mandagapattu, however at other caves of Mahendra we only see plain tetragonal pilasters. The corbels above pillars are in ornamented taranga (wave) style with a median patta. This kind of corbel style is seen in Trichy Upper Cave Temple as well. The bottom cubical part has lotus medallions on its three faces, no medallion on hind face. The upper cubical part, on lateral faces, shows various different styles of foliage and flower decorations instead of lotus medallions. The upper cubical part front face two, one on each pillar, majestic relief of lion. These are shown standing with their tails curving is a unique style, forming English numeral eight. The similar lions we also see on Arjuna Penance at Mahabalipuram. Both the lions are shown with heavy mane. What is the significance of these lions on the pillars? Lion is not associated to Shiva in any terms, of course we do not include Durga here in Shiva’s association. As the cave is dedicated to Shiva, so we keep focus only on him. So there is no relation between Shiva and lions, then is there any other significance of these reliefs? We accepted the theory of name, Simhavishnu-caturvedi-mangalam, of R Nagaswamy above, so when Mahendra was excavating this cave temple, he was aware of its association with his father. How about showing that association in relief form, hence the lions. What you say? On the upper lateral faces of the front pillars are two bas-reliefs. The first is Shiva as Vrishbhantika. He is depicted with four armed and standing in tribhanga posture. In upper left and right arms, he is holding akshamala and mriga (deer), lower right arm is on waist and lower left arm is resting above the head of Nandi, who is standing side by to him. Behind Shiva is shown trisula-dhvaja (trident banner). Nandi is shown in bull form, and he is standing on left side of Shiva. Parvati is shown standing further left if Shiva, under a tree. She is depicted standing in tribhanga posture with two hands, one is resting near her thigh and in another hand she is holding a flower. Shiva and Parvati both are wearing jata-makuta and yajnopavita. Another bas-relief is of great interest. This is the first representation of a dance posture in Tamilnadu hence deserves our kind attention. 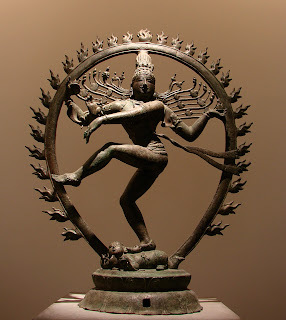 Shiva is shown in a natya karana (dance posture) where his lower left hand is in dola-mudra and moved away from body while his lower right hand is in abhaya-mudra. In his upper hands, he is holding a bowl of fire and parasu (axe). He is standing on one feet, the other feet is raised above the ground, bent at knee joint. Below this raised feet is shown a snake with its hood raised above. Shiva is wearing many ornaments, necklace, anklets in both legs, sarpa-bahu-valaya in his both arms, patra-kundala and valayas in his wrists. His hair tress are flowing in left and right direction. On Shiva’s left side is a gana, who is drumming on an urdhva-maddala (kind of drum), while on his right is another gana who is holding both his hands in anjali posture. This natya karana is depicting bhujanga-tarsita-karana, as described in Natya Shashtra of Bharata Muni. Some scholars suggested that the snake is mesmerized with the dance of Shiva hence he is also in delusion of music and dancing, however the presence of this snake is far more relevant than just getting delusional and dancing on the beats. Translation – Shiva employs all the four kinds of abhinaya (plays), bhasha (verbal), vesha (clothes/makeup), vapukriya (body movements) and gunakritan (emotion). Shiva is full of emotions and he enters into various rasas during his dance, this spectacle is known as trailokya-yatra-mayam (procession of the three worlds). This spectacle is a great enjoyment for the spectators, and Shiva himself is the spectator in his cosmic dance. And through this he pervades the whole universe (sa vyapta avani bhajanam). And hence that dancing Kaplieshvara may grant us fame. So Mahendra was quite aware of this dance form of Shiva and he started his play by paying his tribute to the lord itself. He was so fascinated by this that he took the title ‘Avani Bhajana’ himself. His desire was to extol in the dance to the level of the Lord himself, however well aware that he cannot reach to that level, but he set his goal to achieve that perhaps. Interestingly, in his foundation inscription, this cave temple is referred as Avanibhajan-Palleshavaram, hence housing Avanibhajana and constructed by Avanibhajana. What a remarkable fact! Beyond the pilasters are carved two niches, one on each side. These niches are enclosed within full framed pilasters showing various compositions as per the shilpa texts. These are slender in nature and ornamented at regular intervals. Similar kind of niche arrangement beyond the pilasters is seen at Mandagapptu and Dalavanur as well, however its only at Mandagapattu that we see pillar-like pilaster style. The niches are adorned with similar style makara-torana on top. Two makaras, with a rider on top, are shown facing each other from whose mouth is issuing foliage garland which is terminating in center behind a seated figure. The central seated figure is sitting on a full blown lotus and he is shown wearing a cross-band (channavira) which is mostly seen on warriors. K R Srinivasan suggest that these two central seated figures, on the two makara-toranas, might be representing two nidhis, sankha-nidhi and padma-nidhi. We have already seen an exquisite makara-torana in Dalavanur Cave Temple as well. In these two side niches are housed two warriors. Warrior on north side is shown holding a shield in his left hand which is swung to his right side, while he is holding a danda (stick) in his right hand. His right hand is above his head, seems like he is ready for a strike. He is standing with one leg bent, to get the proper posture so that he can strike well. The whole bas-relief is a snapshot of a movement, which is perhaps the first time such representation in Mahendra’s time. This art of depicting reliefs in motion get its epoch in Mahishasurmardini cave of Mahabalipuram where a very exceptional depiction of Durga as Mahishasurmardini is done. The warrior on southern side is shown in different movement than the northern one, however their clothes and ornaments are almost same. This warrior is holding a shield in his left hand and this shield is held above his head, perhaps to ward off a stoke from top. In his right hand is a danda (stick) which he has held partly hidden behind his back so that after warding off the stroke from top, he can strike with his stick. His hair tress are shown flowing behind, and there is a crescent moon on his hair-band. Do you see any link between these two poses? What if you put both together side by side, you might see that the northern warrior is in move to strike, while the southern one is in posture to defend the move of northern one. Is it? I leave this to you. As seen in other Mahendra caves, this cave also has differentiation of ardha-mandapa and mukha-mandapa, with the help of two rows of pillars and pilasters. The inner row pillars do not have any lotus medallion on the cubical faces. Also the corbels are in regular curved profile, without taranga ornamentation. There is a cell provided at the center back wall of the cave, which is protruding slightly from the wall. There are four simple pilasters at the entrance, hence forming two niches on the sides. 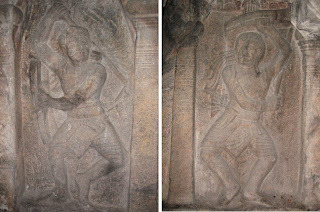 These niches are having bas-reliefs of dvarpalas, which we will discuss later in the article. Inside the cave is a Shiva lingam, which is not carved out of the native rock. Dvarapalas of the cave – Another remarkable aspect of this cave temple is its davrapalas. For the first time in our journey across various Pallava cave temples, we are witnessing a full trisula-pronged dvarpala here. There are two dvarpalas at the entrance of the main cell. The right side dvarpala is standing in tribhanga posture, with one hand on his waist and another over his club. Standing with one leg slightly bent, his club is resting on his left side. The club is entwined by a serpent, whose hood is towards the thigh of this dvarpala. The most interesting feature is the protruding prongs of trisula (trident) from his head. This theory was proposed by A H Longhurst, later Dr Gift Siromoney did an extensive research and gave it a concluding end. As the work of these scholars are getting obscure day by day, so we are grateful to current age scholars who explain these theories in easy to understand way. Vijay has done as very nice article on this theory, and I will highly recommend you all to visit that article. I need not re-iterate the same thing in my article. The left dvarpala is also standing in tribhanga posture with his club on his right side. However we miss the protruding axe part on his makuta. So we can say that only trisula ayudha-purusha is shown here as dvarpala, parasu is missing. Inscription in the cave – There are about four inscriptions in this cave, two belong to the Pallavas and two to the Cholas. We will discuss the Pallava inscriptions in detail here. Inscription 1 – This is a foundation inscription of Mahendravarman I written in Sanskrit, engraved in Pallava Grantha script. This is engraved on the right pilaster of the front row. Translation – By king Lalitankura was caused to be made this (temple) named Avanibhajana-Pallaveshvara – a casket, as it were, (worked at) his will (and enclosing) jewels, (viz.) good deeds. Avanibhajana is one of the titles of the Pallava king Mahendravarman I as engraved in Trichy inscription. Trichy cave temple is named as Lalitankura-Palleveshvara-griham, hence Lalitankura was also a title assumed by the Pallava king Mahendravarman I. There is no doubt that this cave temple was also the creation of Mahendravarman. Inscription 2 – This Tamil inscription is engraved on the left pilaster of the front row. (Line 1) Hail! Prosperity! In the third year (of the reign) of king Vijaya-Nandivikramavarman, – Adavi, the headman of Tiruppalaiyur (near) Perumbalaiyur in Urrukkattu-kottam, having made a request to (i.e. having obtained a sanction of) the glorious Ganga king Nergutti Peruman, – (this) Adavi made the mandapa in front (of the shrine) for (the merit of) his mother Nanga[n]I Nangai. (Line 14) The feet of him who protects this (gift) without destroying (it), (shall be) on my head. Nandivarman III (846-859) was successor of Dantivarman and perhaps the victor of Tellaru battle, however it is not very certain. He had a queen of Rashtrakuta origin. He had a short reign of about 14 years, and not much is known as there is much confusion in differentiating between inscriptions of Nandivarman II and Nandivarman III. As per the above inscription, it seems that Ganga king was a subordinate of the Pallava king at that time. How to Reach – Seeyamangalam is located about 2 km from Desur. It can be reached via Gingee and Vandavasi.